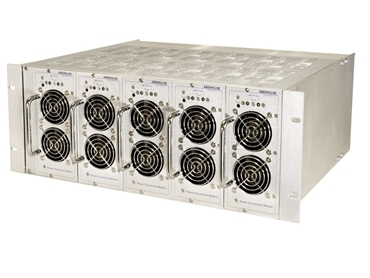 Available from Amtex Electronics , the PFC 419F-5K-4U19 Series is a range of modular, rackmount AC/DC power systems with power factor corrected input. Suitable for heavy duty applications in power utilities, telecommunications and industrial control, the rackmount AC/DC power system is constructed with up to five 1kW plug-in power supply modules assembled in a 4U x 19” x 15” card-frame. Each 4U x 16HP x 304mm plug-in module has a built-in redundancy diode for parallel connection or N+1 redundant operation including hot-insertion. The redundancy diode also allows for a battery to be connected to the output for back-up purposes. The fully loaded PFC 419F-5K-4U19 rackmount AC/DC power system delivers a maximum of 5kW or 4kW with N+1 redundancy. Each plug-in module employs a power factor corrected input and a following half-bridge stage to convert the universal AC input voltage (95-264Vac) to 24Vdc, 48Vdc, 110Vdc or 125Vdc.